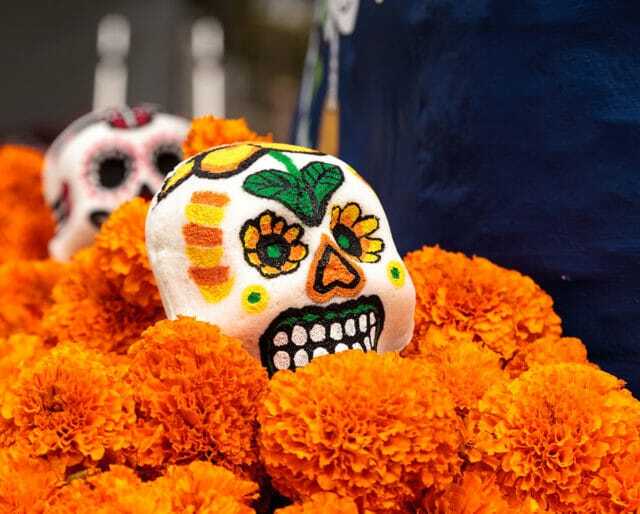 Day of the Dead is a traditional Mexican holiday that stems from the ancient indigenous people of Mexico. On this day, it is believed that the souls of the dead return to visit their living family members. Many people celebrate this day by visiting the graves of deceased loved ones and setting up alters with their favorite foods, drink, and photos. November 2 is most definitely time to remember the good times and remember the loved ones who are no longer with us. Pick a small area in your home (a table works well) and set up a candle, a photo the loved one, and some flowers. It's a simple act of remembrance. Many cemeteries are full with festive sounds, smells, and imagery. Even if you don't have an alter, stop by a local community event to experience the sights and sounds that fill this day. This day is meant to be celebrated with family and friends. Make a large dinner and invite people bring a photo of a loved one that has passed away, and place all photos on a table. During dinner, go around the table and have everyone say one fun memory about their loved one. The key is to keep it fun and festive. While death can be a mournful experience, the Day of the Dead allows us to remember the happy memories we have of our loved ones. Tears of laughter and remembrance fill this day. Alters may come in different shapes and sizes, but they all serve the same purpose, to be a place with various artifacts that remind you of a certain loved one. This day provides you a time to go through old photographs, letters, toys, and other items that may hold sentimental value. The marigold is a delicate, bright yellow-orange flower than symbolizes death. On this day, these beautiful flowers can be seen everywhere, adorning alters, graves to remember a loved one.